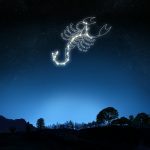 A rising sign in Scorpio is probably the most mysterious and mystical of ascending signs, arousing curiosity and intriguing on what is really inside. It is common that in the beginning it keeps a certain distance and keeps its own space; after all, it is a very cautious and somehow suspicious sign, which ends up generating some difficulty in making compromises. However, it’s all about time and dedication to make a Scorpio feel safe. And as this security increases, all the affection that has been preserved before, begin to surface and reveal a passion and great devotion for their loved ones. This rising sign is probably one of the most intense ascendant signs, bringing the passions to such a level that the native can become possessive and very domineering; this alias is perhaps one of the great “flaws” of any rising sign in Scorpio. This ascendancy often tinges other signs that need introspection, analysis, and understanding. Thus, it tends to draw the energies or the means that we miss from deep inside. In contact with solar signs such as Aries or Sagittarius, it will incite the surpassing of oneself. It tends to develop a spirit of conquest and thus makes things more enterprising, more combative. Associated with the sign of Leo, the rising sign in Scorpio will aim to update what we do not perceive, which is hidden. Thus, it will incite to reveal. Alongside a sign of Earth (Taurus, Virgo, Capricorn), it will be a question of understanding, reflection, construction, internalization of things or emotions. It incites deep analysis in many areas. Linked with signs like Cancer or Pisces, it reinforces emotions, creativity, intuition, the need to bathe in a harmonious, serene and especially reassuring context. However, with the sign of Scorpio, it gives a personality that is more unstable, more complex but also more interesting. Thus, it can be said that in this case all the qualities and all the defects of the Scorpio stand out. Coupled with signs of Air (Gemini, Libra, Aquarius), it makes the native adaptable, sociable, communicative, extrovert, and original. What does your Scorpio ascendancy bring on a daily basis? It gives the taste of risk but also of discovery. Thus, you will constantly want to learn or evolve. Curious about everything and anything, you will aspire to fill your gaps and your weaknesses, to make tools or assets. Adaptable, you will be able to face many situations. Your ascendant gives you a lot of intuition, clairvoyance and you can be a fine psychologist. The questioning does not frighten you and you reveal yourself to be very resistant. When it comes to heart matters, you live with passion and without it, nothing is really possible. Thus, you often invest yourself (body and soul) and sometimes you can get bogged down in complex or destructive relationships. We can say that your path of life is more or less that of renunciation, transformation, questioning. Your ascendant speaks of ‘death’ and resurrection. All your existence is in this picture. You must, therefore, learn detachment.